Hillary Clinton will take responsibility for making mistakes with her email, well sort of but not exactly. She will take responsibility for her failed re-set with Russia, well kind of. 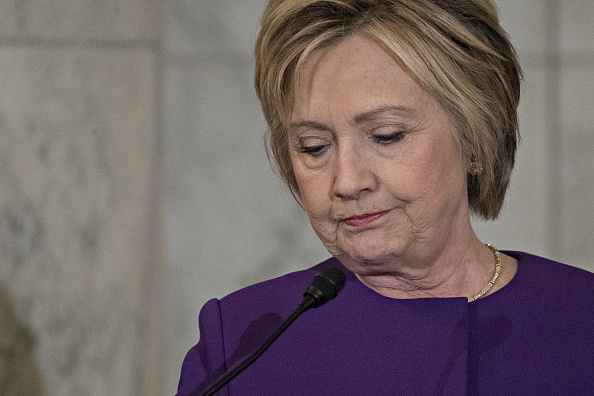 She will say Benghazi was a failure, yet never take full accountability; she never really owns up to her monumental failures as an alleged leader of the Democratic Party or as the undisputed biggest loser in modern Presidential politics in America. She instead points her finger at fellow citizens calling them racist, misogynist, homophobic fools that have no education and no clue what they are voting for. She spews venomous bile in an effort to discredit the millions of Americans that rejected her tired message and voted for something totally different. Hers is a temper tantrum it seems, the likes of which we may have never seen before. She is it seems a spoiled brat that refuses to have any class in the grips of stunning defeat. We would not accept this kind of behavior from four year olds so why would we allow a failed Presidential candidate to cast such disparagement on our fellow citizens just because they voted for someone else? The answer is quite clear; we are rejecting her despicable behavior. Trust me we are taking note of those on the left that continue to call us names and claim they have some divine right to choose the path this great nation should take. We are watching and listening as they try to tear down our American institutions, attack our police, denigrate our military and make fun of our faith. Instead of admitting she lost plain and simple; Hillary is instead flailing, shrill, tone-deaf and trying desperately to rewrite history. Her shocking despair is so consuming all she wants is someone, anyone to blame for her spectacular loss in front of the entire world. Not since Mighty Casey struck out have we seen such a massive favorite collapse so completely and failed so outright. Casey however had enough dignity to walk out of the batters box without blaming the umpire. The mainstream media is happy to report time and again that quote “no one” really predicted Clinton’s failure on Election Day. That’s not exactly true in fact my good friend Todd Wood called it a year in advance and I was on the money weeks before anyone pulled the lever for either Donald Trump or the former Secretary of State. Why doesn’t the mainstream media take the much more honest tact and say Hillary Clinton failed pure and simple. Clinton failed to capture the imagination of the younger generation, the black community, the working poor, the Hispanic community, the middle class, college kids, working moms or frankly any specific demographic in significant numbers. Hillary Clinton is a failed candidate and now that failed campaign with it’s failed message, failed connection, failed narrative, failed inspiration, failed ground game, failed imagery, failed commercials, failed PR, failed media message and frankly failure on all levels belongs to the ages. However, instead of understanding the cause of the defeat or even trying to understand what failed on Election Day the Clinton Machine, or rather what’s left of it, is trying desperately to recast the who Hindenburg-like, Titanic-like failure as the fault of some other force and not Hillary Clinton herself. Hillary Clinton lost because she is totally out of touch with America. It really is quite simple. When was the last time Hillary sat in a drive-thru hoping the kids would just stop fighting long enough to eat their happy meals before practice? When was the last time Hillary actually had to consider how she would make the payment before time ran out? When did Hillary ever have to worry about making payroll, covering an insurance payment, checking on an injured employee or put money aside for the exploding cost of college? Do you think John Podesta, Huma Abideen or Donna Brazille have any idea what goes on after 8 o’clock on a Thursday night in Mio, Michigan, Great Falls, Montana, Wadesboro, North Carolina, Morgantown, West Virginia or Hutchinson, Kansas? Do you think the elitists on the left that are still damned determined to tell you they know better for you and your family have any idea what it is like to shovel snow by hand, or bale hay or run a paper rout as an adult? Hell no. They don’t have any idea what that means. They don’t know what a family restaurant is either. They don’t know that drinking beer out of a can and packing your lunch are really are ‘things’ that real people in America do every day. They have not one clue what it means to walk the aisles of Wal-Mart with a half full cart trying to figure out if there is just enough money left before Christmas to spend extra on a honey ham or just settle for the huge discount on the after-Thanksgiving turkey special. They have no idea what a water pump is or a fuel pump. They certainly don’t know what it’s like to call a tow truck at 7:45 in the morning when either of those pumps finally decides the pumping is over and praying to God you can make it to work on time so you don’t lose your job. They’ve heard of Toys for Tots but have certainly never had to ask for a gift so their babies can have a ‘real Christmas’ this year. I can assure you they have very little understanding of community the way you and I do. They don’t know what’s it’s like to pick up the phone and ask for help that doesn’t include a campaign contribution, the questions to an upcoming debate or what to wear when you meet the latest ‘Big Fish’ on the line to help win the election. They say they love the ‘working-man’ but in all honestly sneer at plumbers, carpenters, janitors and the lunch ladies that looked out for you and me and your kids every day. They claim they are inclusive yet most of them have never hired anyone and beyond their words and claims have never had to back up claims. For the most part they live in privileged neighborhoods where the last big crime was Tom Brady deflating his balls and lying about it. They don’t call the police or hear the sirens wailing by three times each night in pursuit of a criminal or trying to save the life of a punk kid who spiked a little too much heroin. The fact is Hillary Clinton and most of her supporters don’t live in the real America that you and I know on many different levels. They pretend to know and so do their Hollywood play actor friends but in real life there are winners and losers and the sooner they understand that and starting acting that way- the better off we will all be!